Daytona Beach – FUTURES Foundation for Volusia County Schools’ Take Stock in Children (TSIC) named Mrs. Socorro Calkins as its 2019 Mentor of the Year at its annual Mentor Appreciation celebration at Mainland High School on January 30. 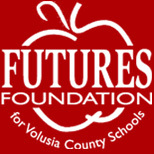 FUTURES/TSIC Volusia has students in all 10 Volusia County public high schools. Mrs. Calkins is an Office Specialist in the Media Center at Deltona High School and has served as a mentor with FUTURES/TSIC since 2013. For the past two years, she has dedicated herself as a mentor to Taylor Bowman, a senior at Deltona High, and Lioned Carrasquillo, a junior at Deltona High. Mrs. Calkins exudes a positive energy which can be seen in the relationships she has built with her mentees. Mr. Carrasquillo had this to say about his mentor, “When I meet with Mrs. Calkins during lunch, I don’t mind missing out on lunch with friends. Sometimes I prefer to be with Mrs. Calkins because she is a significant influence in my life and having someone influential like this is inspiring. I’m glad that we have developed an amazing relationship and I know she will be a lifelong friend because there aren’t many people in the world like her who want to help someone besides themselves.” Ms. Calkins works to bring out the best in both her mentees. Last summer she encouraged Mr. Carrasquillo to apply for and attend a conference in Boston, Massachusetts, something he may not have done if Mrs. Calkins was not his mentor. Mrs. Calkins and Miss Bowman share a passion for music. During their mentor sessions, Mrs. Calkins brings her violin and Miss Bowman brings her clarinet so they can perform duets. Also recognized were six mentors who have volunteered for 10 or more years with the local TSIC scholarship and mentoring program: Alice Fogle, Jeff Hoffer, Josh Poertner, Bevin Spence, Tony Tussing and Alex Wells. The following mentors were recognized for exceeding the required weekly mentor sessions for this school year: Kristin Butrico, Jennifer Casey, DeLand City Commissioner Chris Cloudman, Sandra Dembinski, Mindy Goode, Serene Henderson, Shelley Morrow, Christine Ouellette, a past Mentor of Year Ron Rodgers and Marie Wilson. The appreciation dinner was catered by the Mainland High School Culinary Academy under the direction of Culinary Director Chef Ryan Barbarow. Also in attendance were Volusia School Board Chairman Carl Persis, Volusia School Board Member Ruben Colon, Volusia County Schools Chief Academic Officer Teresa Marcks, and Dist. 4 Volusia County Council Member Heather Post. Take Stock in Children, Inc. is a nonprofit organization, transforming Florida one student at a time. Working in every county throughout Florida, their mission is to break the cycle of poverty for low-income, academically qualified students by providing opportunities for a post-secondary education. They offer college scholarships to students, provide caring volunteer mentors, and instill hope for a better life. 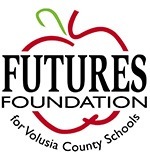 For Volusia County public school students, FUTURES Foundation for Volusia County Schools facilitates the local program under this statewide initiative. FUTURES/TSIC Volusia scholars are selected in the eighth grade through an application process which is assisted by public school guidance counselors and other community agencies working with at-risk, low-income students. A local TSIC student selection committee reviews the applications from public school students and processes the new students. TSIC scholars are paired with a mentor who meets with them for 30 minutes each week on school campus beginning in the ninth grade. FUTURES/TSIC scholars must maintain a weighted cumulative GPA of 3.0 and maintain good citizenship (no drug, alcohol, crime or gang activity). Upon achieving these goals and graduating high school, FUTURES/TSIC Volusia awards a Florida Prepaid tuition scholarship. FUTURES/TSIC Volusia allows for unique engagement from community members interested in becoming a mentor. We encourage the public to go beyond just digital engagement – and become involved in making a real-life impact. Anyone interested in mentoring, may contact Student Services & Mentor Coordinator Shimene Shepard at 386.255.6475, ext. 50724, or sashepar@volusia.k12.fl.us. The local TSIC program is completing this year’s application process and donations are still needed to purchase scholarships for the incoming class of freshmen. Based on legislative funding, currently all scholarship contributions are matched 100% with dollars from the Stanley G. Tate Florida Prepaid Foundation’s STARS (Scholarship Tuition for At Risk Students) Scholarship Program which enhances each dollar donated locally. TSIC scholarship donations are always welcome through the FUTURES Foundation as are planned gifts through wills, trusts and other estate planning avenues. Photo 1: FUTURES/TISC Volusia named Socorro Calkins, second from left, as its 2019 Mentor of the Year . Pictured with Mrs. Calkins are East Volusia TSIC College Success Coach Justine Florez, left, TSIC Student Services & Mentor Coordinator Shimene Shepard, second from right, and TSIC West Volusia College Success Coach Laura Reece, right. Photo 2: FUTURES/TSIC Volusia recognized mentors who have volunteered for 10 or more years with its local program. Pictured, left to right, are Mentors Josh Poertner, Alex Wells, College Success Coach Laura Reece, Tony Tussing and Bevin Spence. Not pictured are Mentors Alice Fogle and Jeff Hoffer. Photo 3: FUTURES/TSIC Volusia recognized mentors who have exceeded the required weekly mentor sessions for this school year. Pictured, left to right, are: Mentors Sandra Dembinski, DeLand City Commissioner & Mentor Chris Cloudman, and past Mentor of Year Ron Rodgers. Not pictured are Mentors Kristin Butrico, Jennifer Casey, Serene Henderson, Mindy Goode, Shelley Morrow, Christine Ouellette and Marie Wilson.